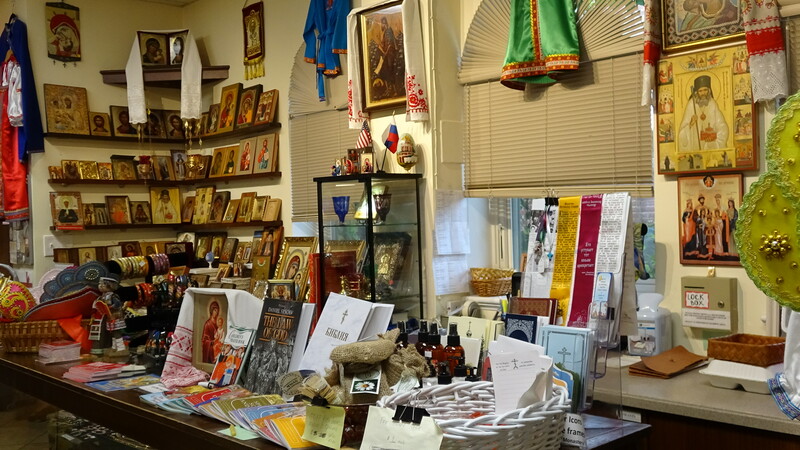 We invite you to visit our Sisterhood Kiosk and Bookstore, offering both religious and Russian ethnic wares for sale as well as hand crafted items produced by area Orthodox monasteries. 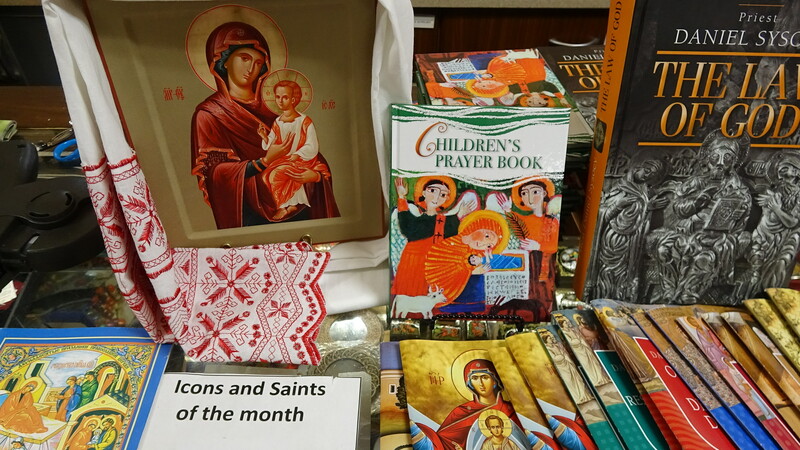 We carry a large collection of many types and sizes of icons, both hand painted and printed. Our parish hagiographical icon of St. John was painted by iconographer Victor Kazanin in 1994 and depicts the saint holding the St. John the Baptist Cathedral in Washington, DC in his hand. Our cathedral parish is the only church community founded by him in the United States. St. John of Shanghai and San Francisco was a man of deep faith, which had transformed him into a conduit of God's mercy during his lifetime. 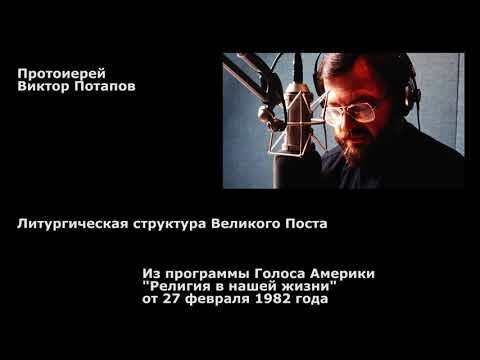 He lived perpetually with love for God and humanity, all his words, deeds and prayer vividly testifying to the gospel of Christ. As did the life of the bishop himself, this icon strikingly reflects unworldly dedication of the saint to God and neighbor. Through the frame of icons surrounding the image of the bishop, we see the fullness of grace and light that St. John carried in all matters assigned to him by the Lord - in the creation of a shelter for thousands of homeless children in China, to the protection of the lives of his flock in the US Congress, even in the memorial service for the Serbian king Alexander I of Yugoslavia in the middle of a crowded street of Marseille, where the ardent defender of Russian immigrants, was killed. 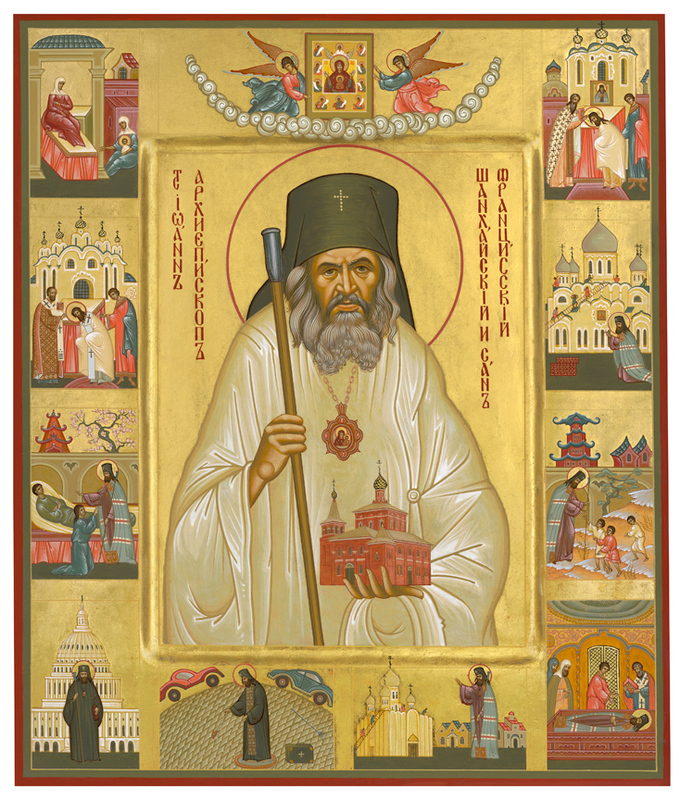 The icon is unique, firstly, by the fact that it is the first hagiographical icon of St. John of Shanghai and San Francisco, that is, depicting the main stages of the life of the saint, as well as by the fact that the saint is depicted holding our Cathedral in his hand which he personally founded in 1949. Copies of the icon are available in several types and sizes: $25.00, $33.00, $ 75.00, $ 100.00 and $ 150.00. Sold only in our sisterhood book store. For a limited time, icons of St John depicted holding our Cathedral without the main stages of his life are on sale for 20 % off ($20.00 and $25.00 - two sizes only). While supplies last. Both items are perfect holiday gifts and unique to our St John the Baptist parish. The Kiosk specializes in gold, silver and enamel wearable crosses, carved crucifixes, prayer ropes, icon bracelets, incense supplies, vigil lamps and wicks, infant and adult size baptismal gowns and wedding candles. 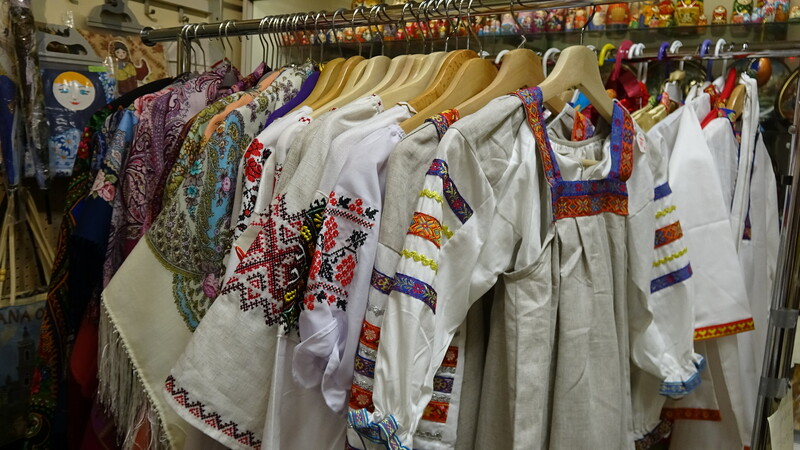 We also carry non-religious items imported from Russia, such as greeting cards, dolls, matroshkas, lacquered Palekh boxes, Faberge-type jewelry, toys, crafts and other souvenirs. We support three nearby Orthodox monasteries by seasonally offering their products for your convenience. On our shelves you will find goats milk soaps and lotions from the Holy Cross Monastery in West Virginia; organic creams, herbal teas and handicraft items from St Elizabeth Skete in Jordanville NY and church calendars and printed materials from Holy Trinity Monastery also of Jordanville. For Christmas our Kiosk offers an impressive Santa's workshop of ornaments, toys, specialty linens, and greeting cards. The Easter kiosk typically includes traditional paschal basket items such as pysanki, egg dies, cheese pasha forms, a fabulous assortment of Faberge type eggs and 'matroshka lovers' items such as nesting dolls, stickers, key chains and other memorabilia. Closer to Palm Sunday you will be able to purchase fresh vanilla beans, zubrovka and kulich. 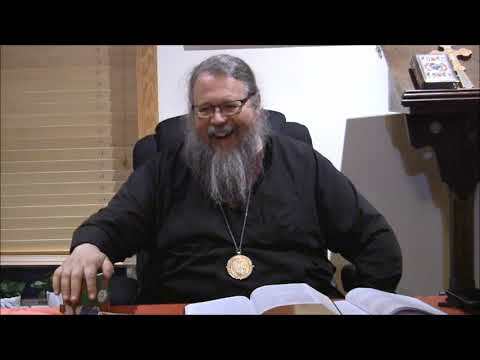 If you are looking for a good Bible, adult or children's prayer book in either Slavonic, Russian or English, check us out before going elsewhere. 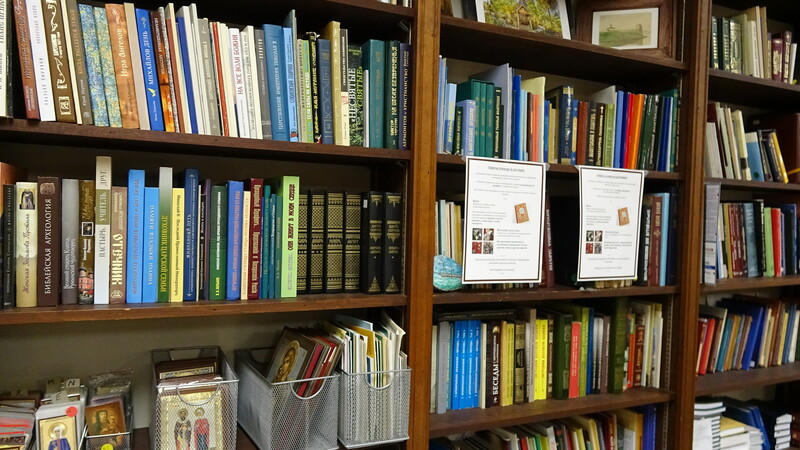 We receive newly published religious books on a regular basis and announce them in our monthly Parish Life bulletin. 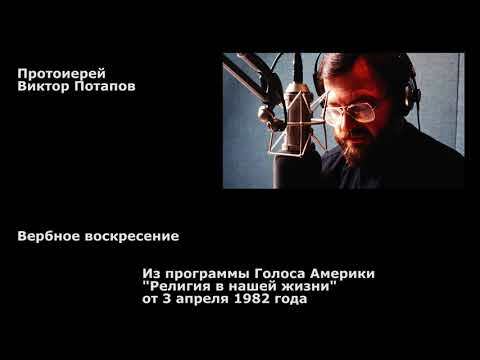 The authors are both Russian and American born and include some of our own parishioners. CDs of church and Russian folk music as well as occasional DVDs complement the book assortment. The Kiosk and Bookstore is open on Sundays 10:00AM - 2:30 PM and other days when church services are scheduled. Looking forward to seeing you in our Kiosk and Bookstore!